RADIOLAB is public radio’s cult sensation about science, wonder and discovery. 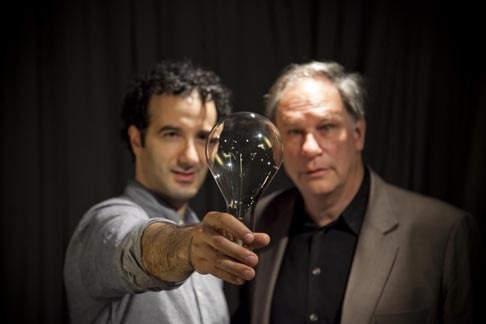 With curiosity and wit, co-hosts JAD ABUMRAD and ROBERT KRULWICH explore big questions – Time, Music, Words - through science, philosophy, human experience and experimental audio. The result is a potent elixir of interviews with experts, first-person storytelling and radio theatre, all wrapped up in some of the most innovative sound design ever to spill out of the radio. The winners of the 70th Annual Peabody Awards were announced today by the University of Georgia’s Henry W. Grady College of Journalism and Mass Communication. The Peabody Award is among the most prestigious awards for broadcasting and cable excellence, and given solely on merit rather than within designated categories. The awards will be presented in May at a luncheon at the Waldorf-Astoria Hotel in New York. In recent years, WNYC Radio has also won Peabody Awards for programs including The Brian Lehrer Show, On The Media, Radio Rookies, and Studio 360 with Kurt Andersen. New York Public Radio is New York's premier public radio franchise, comprising WNYC, WQXR, and The Jerome L. Greene Performance Space, as well as www.wnyc.org, www.wqxr.org and www.thegreenespace.org. As America's most listened-to AM/FM news and talk public radio stations, reaching 1.1 million listeners every week, WNYC extends New York City's cultural riches to the entire country on-air and online, and presents the best national offerings from networks National Public Radio, Public Radio International, American Public Media, and the British Broadcasting Company. WNYC 93.9 FM broadcasts a wide range of daily news, talk, cultural and music programming, while WNYC AM 820 maintains a stronger focus on breaking news and international news reporting. Classical 105.9 WQXR is New York City's sole 24-hour classical music station, presenting new and landmark classical recordings as well as live concerts from the Metropolitan Opera, the New York Philharmonic, among other New York City venues, immersing listeners in the city's rich musical life. In addition to its audio content, WNYC and WQXR produce content for live, radio and web audiences from The Jerome L. Greene Performance Space, the station's street-level multipurpose, multiplatform broadcast studio and performance space. For more information about New York Public Radio, visit www.nypublicradio.org.